Communication is something that we are constantly doing. Even when we are not speaking words, we are communicating through nonverbal cues, such as body language or facial expressions. When we communicate poorly, the defenses of person you are talking to go up, which makes us unable to connect with them and resolve the issues at hand. In order to communicate effectively, it is important for us to understand how our message is being sent, and how the person we are communicating with is receiving it. Although our intentions may be good, the impact it has on the person may be less than ideal. 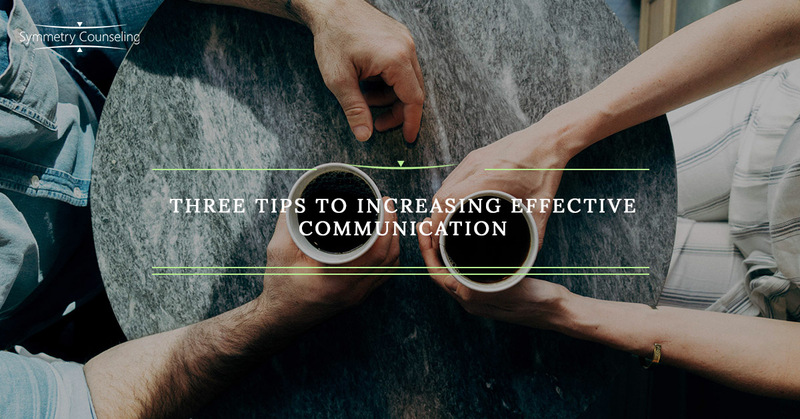 As a couple and family therapist, I have seen the following tips help partners and families get back on track to effective communication and ensure that our intentions and the impact match up. 1) “I” Statements – When we communicate with people, at times we use “you” statements. Such as, “you are never home to clean,” or “you don’t understand me.” When “you” is used in this way it is natural for someone to feel criticized, and they may get defensive. To increase effective communication in this instance, attempt to use “I” statements, instead of “you” statements. For example, “When I have to clean the house alone, I feel taken advantage of.” Switching to this communication style helps us get our point across without making the other person feel criticized. In turn, they are less likely to get defensive, and you are more likely able to resolve the issue. 2) Listen to Understand – Seems simple, right? I frequently notice in my work, and in my personal life, that when one person is talking, others are only half-listening. This is usually in anticipation to talk next, either to voice their own opinion or to defend themselves. One of my favorite quotes is “The biggest communication problem is we do not listen to understand, we listen to reply” by Stephen R. Covey. This quote is a good reminder to attempt to fully listen, even when you are hearing “you” statements or other things that may trigger you. If your goal were to resolve the problem, it would be difficult to do so without understanding the other person’s perspective. An effective way to ensure that you are listening to understand is to repeat what you heard, and confirm with that person that you heard them clearly. 3) State Expectations – I have noticed that not stating expectations is a very common communication error between partners, family members, and friends. We generally grow up being told to treat others how we want to be treated, and in turn, we learn to communicate with people the way that we want to be communicated with. For instance, some people are hoping for an outlet to vent, while others are looking for advice. Commonly, we assume what the other person is hoping for based on our own needs, and we miss being there for them. It is important for us to ask others what they are hoping for in the moment, and it is imperative for us to know our own needs and state them. These tips are helpful in increasing effective communication because they will help you tap into your empathic side. Empathy is putting yourself in someone else’s shoes: truly understanding their feelings and the experience of where they may be coming from. Ultimately, empathy will lead you to do these tips naturally. If you believe that you could improve your communication skills with the relationships in your life, contact Symmetry Counseling to be matched with one of our talented clinicians.